John Howard Carpenter (born January 16, 1948) is an American filmmaker, screenwriter, musician, and composer. 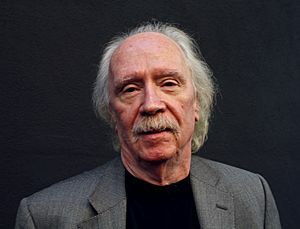 Although Carpenter has worked with various film genres, he is associated most commonly with horror, action and science fiction films of the 1970s and 1980s. He is known for horror and science fiction movies including Halloween, The Thing and Escape from New York. Carpenter is also notable for having composed or co-composed most of his films' music. Carpenter was born in Carthage, New York. He and his family relocated to Bowling Green, Kentucky during 1953. He was interested in films from an early age, particularly the westerns of Howard Hawks and John Ford, as well as 1950s low-budget horror films, such as The Thing from Another World and high budget science fiction like Forbidden Planet and began filming horror short films with 8 mm film even before starting high school. He attended Western Kentucky University, where his father chaired the music department, then transferred to the University of Southern California's School of Cinematic Arts during 1968, but quit to make his first feature film. John Carpenter Facts for Kids. Kiddle Encyclopedia.